The US military says it has dropped a 21,600lb (9,800kg) bomb on a tunnel complex used by Islamic State militants in Afghanistan. The GBU-43/B Massive Ordnance Air Blast Bomb (MOAB), known as "the mother of all bombs", is the largest non-nuclear bomb ever used by the US in a conflict. The Pentagon said it was dropped from a US aircraft in Nangarhar province. The news came hours after the Pentagon admitted an air strike in Syria mistakenly killed 18 rebels. It said a partnered force had mistakenly identified the target location as an IS position, but the strike on 11 April had killed rebels from the Syrian Democratic Forces, which is backed by Washington. 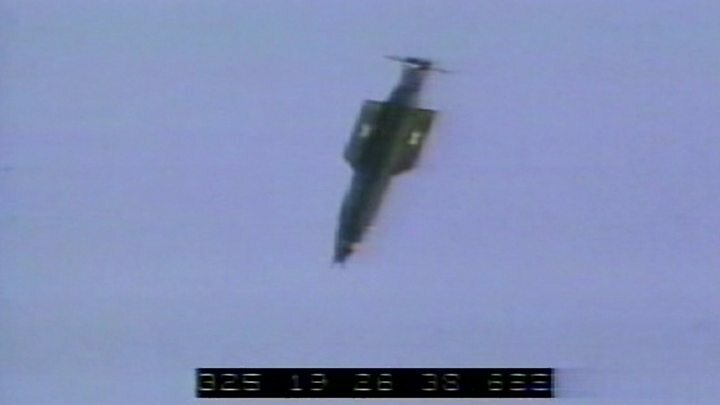 How powerful is 'mother of all bombs'? The strike in Afghanistan follows last week's death of a US special forces soldier fighting IS in Nangarhar. The GBU-43/B bomb was dropped in Achin district on Thursday evening local time, the Pentagon said. It is more than 9m (30 feet) in length. It was first tested in 2003, but had not been deployed in combat before. "We targeted a system of tunnels and caves that ISIS fighters use to move around freely, making it easier for them to target US military advisers and Afghan forces in the area," White House Press Secretary Sean Spicer said, using another name for IS. He said necessary precautions were taken to prevent civilian casualties and "collateral damage". Achin district governor Esmail Shinwari told the BBC there were no civilian casualties because no civilians lived in the area. Earlier Mr Shinwari told the AFP news agency that the explosion was the biggest he had ever seen and that huge flames "engulfed the area". Media captionSpeaking at the White House: "Another successful job, we are very proud of our military"
The US has not yet confirmed the results of the strike in detail, but a local official told the BBC that many IS militants were killed, allegedly including the brother of a senior leader. 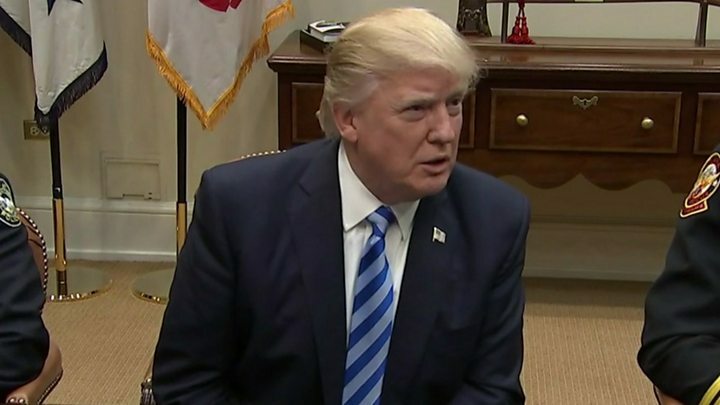 US President Donald Trump called it "another successful job". The clue is in the ungainly name - the MOAB or GBU-43/B massive ordnance air blast is the US military's most destructive conventional (that is non-nuclear) bomb. It is a huge weapon and is GPS-guided. It was dropped from a MC-130 aircraft - the US Special Forces variant of the Hercules transport. The weapon is carried on a special cradle inside the aircraft from which it is extracted by a parachute. Its principal effect is a massive blast over a huge area. It is a larger version of weapons used during the Vietnam War. The Trump administration's policy towards Afghanistan remains under consideration but the use of this weapon sends a powerful signal that IS is top of the administration's target list wherever its offshoots may be found. Gen John Nicholson, commander of US forces in Afghanistan, said the jihadist group's "losses have mounted, they are using IEDs, bunkers and tunnels to thicken their defence. "This is the right munition to reduce these obstacles and maintain the momentum of our offensive." Mr Shinwari said clearance operations by Afghan special forces with US air support had begun in the area nearly two weeks ago. Many IS militants had been killed or injured, he added. IS announced the establishment of its Khorasan branch - an old name for Afghanistan and surrounding areas - in January 2015. It was the first time that IS had officially spread outside the Arab world. It was the first major militant group to directly challenge the Afghan Taliban's dominance over the local insurgency. IS in Afghanistan: How successful has the group been? However, experts say it has struggled to build a wide political base and the indigenous support it expected in Afghanistan. Estimates about IS's numerical strength inside Afghanistan vary, ranging from several hundred to a few thousand fighters. US forces say their number has been cut in half since early 2016 due to military operations.